We welcome Dori to our list of Pizza Experts. You can read more from her on her website, Fat Kids Club. All good things come out of Brooklyn, don’t they? The Dodgers, my Grandma, and damn good pizza. And eventually, all good things that come out of Brooklyn migrate somewhere else. The Dodgers went to Los Angeles, my Grandma went to Century Village, and Authentic Brooklyn Pizza came to Boca Raton. Located just east of Interstate 95 on Palmetto Park Rd., Authentic Brooklyn Pizza (ABP) currently resides in a building that doesn’t even house its very title. Under the sign “Mario the Baker” – the name of the previous tenants – ABP is still getting settled in nearly three months after opening. They don’t need that much work, really, because the sign will eventually change. But the pizza – the pizza should stay exactly the way it is. 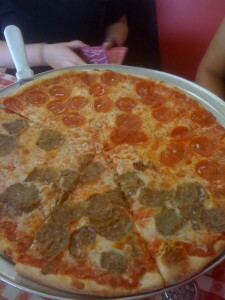 During my recent visit, I had the luxury of eating the pepperoni pie. Large slices of salty pepperoni with a light, slightly crunchy, thin crust. If I had more room in my stomach, I would have eaten more. That pizza was amazing. Since I’m not a big fan of inordinate amounts of sauce, I’m glad Tony the manager isn’t, either. A very little amount of sauce – what some of the other pizza eaters considered too little – was absolutely perfect for me. My theory is this: if there’s too much sauce, then there isn’t enough pizza. This pie had a great balance of all ingredients. Me and my other pizza-eaters that day had the opportunity to try to meatball pizza as well. Sort of like a meatball sub (but less sauce, thankfully), the pizza had sliced meatballs that were the same size as the large pepperoni pizza. They were a little spicy, but I actually thought that’s what made the pizza so tasty. I give Authentic Brooklyn Pizza 7 out of 8 slices. Maybe if they get their name on their restaurant, I can reconsider my rating.